This week’s Telly Addict bids a merry, upbeat farewell to Series Four of Downton Abbey on ITV; measures the running time of two extra-length comedies, Fresh Meat on C4 and Ambassadors on BBC2; sings along without much gusto to The Choir on BBC2; squares up to Bouncers on C4; frets over the dog on Bates Motel on Universal; and wonders if Portrait Artist Of The Year on Sky Arts1 will draw a crowd. Laughs aplenty this week on Telly Addict, although not, to be honest, from Downton Abbey on ITV, whose fourth series continues to play out like a Smiths song; elsewhere however, comedy abounds: The Wrong Mans on BBC2 (already reviewed in great detail on this very blog), London Irish on C4 and the comeback farewell of The IT Crowd on C4; also, while we’re about it, By Any Means on BBC1, Marvel’s Agents of S.H.I.E.L.D. on C4 (nice importing!) and a lovely Culture Show special on Northern Soul on BBC2 that allowed incoming Channel Four News culture editor Paul Mason to spin like a twisted wheel. PS: I hadn’t seen the final episode of Breaking Bad when we recorded this yesterday. I have now. But I doubt I’ll be able to meaningfully review it on Telly Addict for fear of spoiling it for law-abiding citizens of the UK who don’t subscribe to Neflix. I may blog about it here instead, in a safe zone. There’s only one show in town this week on Telly Addict, and it’s the one about the big house in Yorkshire with the servants and masters and Labrador. Downton on ITV dominates, but there’s drama, too, from The Fried Chicken Shop on C4, Peaky Blinders on BBC2 and Whitechapel on ITV; plus, a glorious BBC4 history of soundtracks, Sound Of Cinema with Neil Brand, and a bafflingly-scheduled new sitcom on BBC1, Father Figure, which I would have loved as a kid. For this week’s Telly Addict Guardian TV review, in which the great Downton–Spooks war is discussed, and Curb Your Enthusiasm welcomed back, click here. Downton Abbey is, believe it or not, just a television programme. It’s on ITV1, it’s set in the past, it draws upon roughly the same transitional period for the English class system as such previous television programmes as Upstairs Downstairs, Brideshead Revisited and Flambards, and everybody’s gone nuts for it. Written by Julian Fellowes, and not indebted to a literary source, it feels very much tailor-made for a Sunday night audience. When it arrived on our screens last September, it was an instant hit, scoring around 10 million viewers an episode. Period dramas of this type have never really gone out of fashion, but they do seem to have enjoyed a renaissance over the last few years, perhaps as a reaction to the more hi-tech, CGI-dominated, sci-fi entertainments predominantly served up to us. With the fashionable success, either critical or commercial, of US imports like The Sopranos, The Wire and the CSI franchise, with their contemporary grit and violence, you can also see a gap widening for drama set in a less coarse era, when forensic science held no sway, and warfare was only just getting mechanised. Upstairs Downstairs, to my mind one of the finest TV series this country has ever produced – for ITV, lest snobs forget – set a high bar for the historical saga between 1971 and 1975, and is just as watchable today. It was, however, basically a theatre piece, its action played out against plywood sets, and its occasional forays on location marked mainly by the jarring switch from videotape to grainy film quality. When it launched, without fanfare, and having sat in the vaults at ITV for a year, unloved, its first episode did not score 10 million viewers overnight; it went out at 10.15 on LWT and took its time to bed in. It felt like bad timing that the BBC revived Upstairs Downstairs last Christmas, just a couple of months after Downton Abbey, when the new kid on the block was so indebted to the old kid. Downton began with the sinking of the Titanic, with a key character onboard; Upstairs Downstairs covered this in its third series, when Lady Marjorie, a major character, perished at sea on the Titanic. Perhaps this is the difference not just between the two programmes, but between the eras in which they were first broadcast. 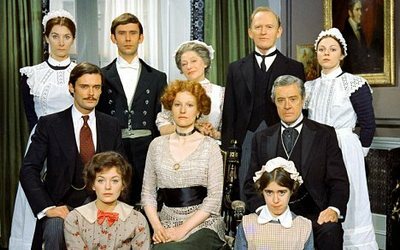 In 1971, it was fine for an ITV period drama to begin with an opening episode whose main storyline was a new parlourmaid starting work at 165 Eaton Place who wasn’t quite what she seemed; in 2010, it had to be the sinking of the Titanic and an inheritance crisis. The other thing Downton has against it is hype. ITV1 are rightfully pleased with its success, and it’s great for the drama industry that it has found such a Teflon hit; the last thing we need in this country, culturally, is for TV drama – and comedy – to be underfunded in favour of wall-to-wall talent and game shows, and “scripted reality”. But the second series, which began on Sunday opposite Spooks, arrived amid fanfare, ticker tape, a twenty-one gun salute and acres of listings-mag, TV and newspaper anticipation (Radio Times caught the mood with its “Souvenir Issue” – my employer hasn’t been this excited, and on the money, since Doctor Who came back). It can live up to this hype, but such expectation demands numbers, and numbers are achieved not through taking risks, but throwing more big names at the screen and giving people what they want: big stories, big world events, broad brush strokes. Watching Upstairs Downstairs – and I’ve done so on DVD box set in the last couple of years so this is not nostalgia – is like having a long, luxurious bath in the past. Downton is more like being whacked in the face with some rolled-up Wikipedia printouts. I’m not sure I’m made of stern enough stuff for that kind of an assault every Sunday. Last year, I was asked to contribute an essay on television to the Faber book Shouting At The Telly. It’s a very good collection of writing actually, with pieces by Boyd Hilton, Rebecca Front, Emma Kennedy and Richard Herring (and some people I have never met). I wrote about Upstairs Downstairs – the original – and I thought I’d republish it here, as the show is back, and it suddenly seems half-relevant. Thanks to editor John Grindrod for allowing me to reprint it. If you’re interested in the book, you can buy it here. Or some other places. It is October, 1971, a Sunday night. With its familiar fanfare, the LWT ribbon unfurls from left to right across a black screen. A simple title card reads Upstairs Downstairs, under the imperious Alexander Faris theme tune (dah-dah-da-dah-da-daah); further captions inform us that the episode we are about to watch is called On Trial, written by Fay Weldon and set in November, 1903 (this information is accompanied by suitable etchings from Punch). The establishing location shot: we pan across white-painted Victorian townhouses through a foreground horse and cart, as an upright gentleman in a top hat passes a furtive lady in long skirt and bonnet. She tentatively ascends the steps of 165 Eaton Place, a prospective parlourmaid. A butler impatiently redirects her to the servants’ entrance, “downstairs”, thus deftly establishing in a wordless exchange the title’s two-tier, olden-days caste system. A nanny with a pram passes across our field of vision, because it’s television law. A portent of things to come, the downstairs bell rings before the maid has pulled the cord. Later, a bedroom light will go out before she has snuffed out the candle. The maid may be on trial, but the actors, it seems, are not. Patsy Smart, who plays Roberts, hasn’t learned her lines properly, has she? Even if she has, she still sloppily muffed the name of a principal character, in the first 15 minutes of the first ever episode of a brand new series. I’m on the sofa, every time, shouting “Cut!” and adding, “Let’s retake that from the top of page 14!” But they never do. I guess we should give Patsy a break: it’s a big cast – lots of pesky names to remember – and the dinner-table scene is pretty complicated, with eight speaking parts and a lot of plate-passing; sufficient for the director to plough on regardless when one of his luvvies arses it up. This is the cold, hard reality of a medium-budget ITV drama in 1971. The programme – which, to be fair to all concerned, began, unloved, in a graveyard slot and built its audience gradually – was shot like a stage play in the then-traditional manner, with fixed cameras, long takes and little time in a punishing turnaround for endless “pick-ups”. Overdubbing would have been a luxury, hence the endless parade of misreads and muffs, the same kind they let Wilfrid Brambell get away with in Steptoe & Son. Even Gordon Jackson, who, over five series and 60 episodes, made Angus Hudson (which is his name) one of TV’s all-time great fictional creations, stumbles over his words and corrects himself, mid-sentence. In episode two, he demands, “What has been going on bond … behind my back, Sarah?” And he’s just described his master, Lord Bellamy, as the Undersecretary of State for something called the Admirality. In the words of Mrs Bridges, it’s a right two and eight and no mistake. Lord Bellamy himself, played with upstanding dignity and humour throughout by David Langton, has a habit of looking at the camera. Well, not exactly, but he’s constantly sort of glancing at it, especially when crossing the morning room for a sherry or to lean on the mantelpiece: he tries to ignore it while actually drawing attention to it. Langton honed his craft on the stage, you see. Watching Upstairs Downstairs makes me achingly nostalgic – not for the starched collars and shifting attitudes of the Edwardian era, but the two-inch tape glare and shifting sets of the 1970s, when period drama on television was still a case of erect chipboard, run up crinoline, block thesps, point camera and shoot. Upstairs Downstairs may appear slipshod and not a little quaint to eyes more accustomed to the cinematic, location-heavy, deep-focus grandeur of Cranford or Little Dorrit, but what made it great was the storytelling, a skill that transcends the limitations of technicality. Ambitiously chronicling three decades of 20th century English life, dealing with shellshock, suicide, scandal, suffrage and the ultimate collapse of the old class system, its greatest achievement was to defy LWT drama controller Cyril Bennett, who said, “It’s very pretty, but it’s just not commercial television. They’ll switch off in their droves.” It went on to be shown in over 70 countries, and picked up two Baftas, seven Emmys, a Golden Globe and a Peabody. Now I’ve revisited plenty of TV shows I adored in my youth and beyond that first Proustian rush, the majority really don’t hold up. I may never again know the crushing sense of disappointment of buying Starsky & Hutch on video, or sitting excitedly down to a rerun on UKTV Drama of Shoestring, but Upstairs Downstairs has survived, intact, as compulsive viewing. The goofs are all part of that. Just as they are affectionately logged on Steve Phillips’ impeccable UpDown website, so they form part of the warp and weft of an epic series made before technology, especially digital, turned TV plays into a thing of the past. Now, even Holby City looks like a Hollywood movie. Poirot, still running after 19 years, has lost much of its theatrical, drawing-room charm of late – it’s all beguiling close-ups of his moustache or a daisy that add literally nothing to the unfolding plot, but might get the director his first movie job. In the words of Mrs Bridges: no good will come of it, you mark my words. Let us, then, celebrate Patsy Smart for calling Mr Hudson “Mr Hudston”. I have nothing but admirality for her.